Vivien A. Schmidt is Jean Monnet Professor of European Integration, Professor of International Relations in the Frederick S. Pardee School of Global Studies and Professor of Political Science at Boston University, as well as Founding Director of BU’s Center for the Study of Europe. She received her B.A. from Bryn Mawr and her Masters and PhD from the University of Chicago. 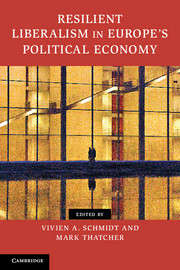 Schmidt’s research focuses on European political economy, institutions, democracy, and political theory—in particular on the importance of ideas and discourse in political analysis (discursive institutionalism). Her latest books include the forthcoming Europe’s Crisis of Legitimacy: Governing by Rules and Ruling by Numbers in the Eurozone (2019), Resilient Liberalism in Europe’s Political Economy (co-edited, 2013), Debating Political Identity and Legitimacy in the European Union (co-edited, 2011), Democracy in Europe (2006)—named in 2015 by the European Parliament as one of the ‘100 Books on Europe to Remember’—and The Futures of European Capitalism (2002). Her honors, awards, and fellowships include a Guggenheim Fellowship, an honorary doctorate from the Free University of Brussels (ULB), the Belgian Franqui Interuniversity Chair for foreign scholars, a Rockefeller Bellagio Center Residency, and Fulbright Fellowships to France and the UK. She was recently named a Chevalier in the French Legion of Honor. Schmidt is a Visiting Professor at LUISS Guido Carli University in Rome and at the Copenhagen Business School. She has also been a visiting professor or visiting scholar at the Free University of Berlin, the Free University of Brussels, Sciences Po in Paris, the European University Institute, and Oxford University, among others. She is past head of the European Union Studies Association (EUSA) and sits on a number of advisory boards, including the Wissenschaft Zentrum Berlin, the Vienna Institute for Peace, the Foundation for European Progressive Studies (Brussels), and the Sheffield Political Economy Research Institute. She has published a dozen books, over 200 scholarly journal articles or chapters in books, and numerous policy briefs and comments, most recently on the Eurozone crisis. Her current work, supported by a Guggenheim fellowship, focuses on the ‘rhetoric of discontent,’ through a transatlantic investigation of the populist revolt against globalization and Europeanization.